Guinness beer is a stout that is beloved by beer fans and bakers all over the world. Guinness is the secret ingredient in many chocolate cakes, where it enhances the chocolate flavor and helps to produce a moist, tender cake. This Vanilla Guinness Sheet Cake leaves out the chocolate, but keeps the stout for an unusual twist on a classic vanilla cake! The batter starts out like most vanilla cakes, with butter, sugar, eggs and plenty of vanilla. Instead of adding milk or another dairy product, Guinness beer is added to the mixture. It will give the cake a slightly deeper color than most vanilla cakes, but it adds a surprising amount of flavor once the cake has baked. When you cut into the cake, you’ll get a hint of that bready beer flavor – that somehow really works well with the buttery vanilla of the rest of the cake. There are also hints of coffee and chocolate that come through more clearly as you go back for bite after bite – and this cake is surprisingly addictive, so I suspect that you will! I finished off the cake with a chocolate buttercream frosting that has a small splash of Guinness in it, as well. The Guinness ties it into the vanilla cake and also lets you enjoy the classic pairing of Guinness and chocolate. 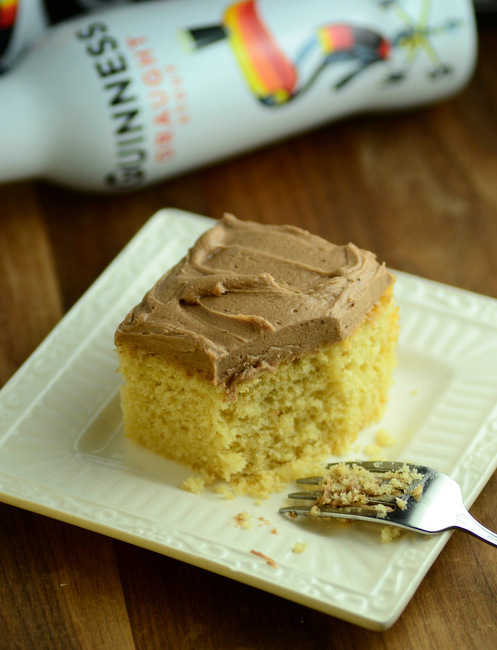 The chocolate in the frosting helps to highlight that hint of Guinness in the cake, too. It’s a fun and unusual combination that is well worth trying. You could bake this cake up as a birthday treat for a Guinness fan or as a celebratory dessert for a St Patrick’s Day party. 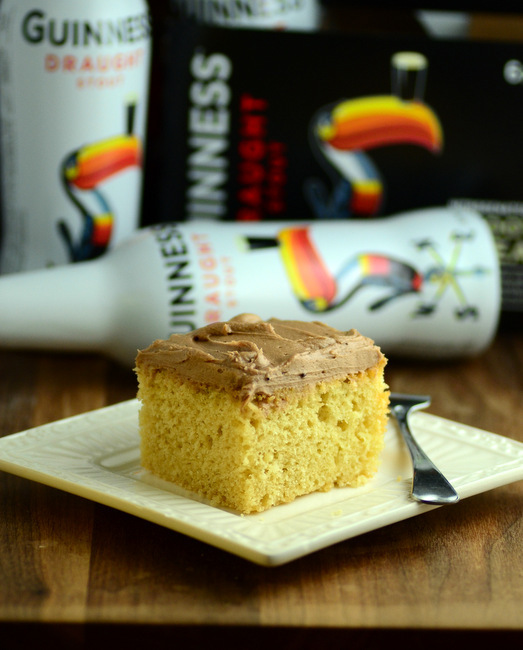 The Guinness used in the cake batter should be room temperature, but serve this cake with a glass of cold Guinness if you’re up for it! Preheat oven to 350F. Lightly grease a 9×13-inch baking pan. In a large bowl, cream together butter and sugars until light and fluffy. Beat in eggs, one at a time, followed by vanilla extract. Stir in half of the flour mixture, followed by the Guinness. Stir in the remaining flour mixture, mixing only until no streaks of dry ingredients remain and batter is uniform. Pour batter into prepared pan and spread into an even layer. Bake for 30-35 minutes, or until the cake springs back when lightly pressed and a toothpick inserted into the center of the cake comes out clean. Allow cake to cool completely before frosting. Makes 1 sheet cake; serves 16-20. In a large bowl, beat together butter, Guinness, cocoa powder and vanilla extract. Mix in two cups of confectioners’ sugar until mixture is smooth. Gradually blend in the rest of the confectioners’ sugar until frosting is thick, smooth and spreadable. Spread evenly over cooled cake.